The rains have finally slowed long enough to venture outside- and there are mushrooms! The boletes have started popping up right on time here in Rhode Island (mid-late June). I found my first Chestnut Bolete right in my backyard this morning. 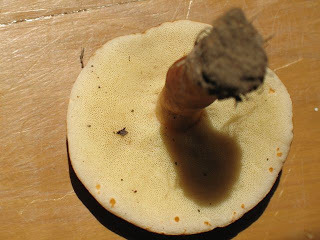 About two inches across, solitary with a deep chestnut colored cap and a very pale yellow underside. I am focusing on my bolete identification skills first for a couple reasons: boletes are a smaller group of mushrooms, more easily identifiable, have fewer toxic species, and a bunch of tasty ones are locally available. Basic mushroom lesson: The "classic" mushroom has gills on the underside of the cap (known as the pileus in mycology circles). They includes most of the mushrooms we are used to buying in the store- white button, crimini, portobello, oyster and are often refered to as "agarics". Boletes by comparison do not have gills- instead they have pores on the underside of the cap, as show in the picture of the Chestnut Bolete below. 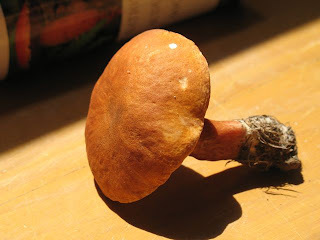 Now that the mushroom season seems to be in full swing I hope to start compiling a good list of local mushrooms, as there does not seem to be such as list readily available online. Leave a note if you have more information on a species or if I have mislabeled a species!